Following the sudden death of her mother Roberta ‘Robbie’ Jordan has moved from California to South Lick in Southern Indiana. It was her mother’s home town and her only Aunt still lives there. When the book opens Robbie is launching her new business: a breakfast restaurant and ‘country’ kitchen store. Not long after the successful opening celebrations, a woman who Robbie has had some run-ins with is murdered, with one of Robbie’s unique cheese biscuits stuffed in her mouth. This is my kind of cosy mystery. It’s light, ghost free and the story is not drowned out by a gimmick. A harder combination to find than you might expect. Although it follows the usual tropes for the genre the setup here is well within the bounds of credibility and there are enough surprises along the way to keep the average reader guessing. Of course Robbie is keen to find out who other than herself might have a motive for murder which provides the main thrust of the narrative. But during this exploration of her fellow townsfolk Robbie learns something about her own family history that she was previously unaware of and this adds genuine interest to the story as well as some avenues for future developments for the series. There’s a good mix of interesting characters, including a couple of potential love interests for Robbie. Neither of them is a police officer, something of a rarity for the genre, though one is a lawyer. The author does a good job of introducing all these new people and giving the reader enough time to get to know them all. I particularly liked Danna, the teenage girl Robbie hires to help out in the restaurant, and her Aunt Adele who is ‘elderly’ but not old if you know what I mean. I always like it when characters of all ages are depicted intelligently. And Day gets points too for not making the police out to be a bunch of imbeciles, a theme I am not a huge fan of. Day has drawn on her real-life skills in linguistics to highlight some local Indiana language oddities. To be honest these regional idiosyncrasies were largely lost on my Australian eyes but I appreciate the effort. I’m not sure if anything else about the setting particularly screamed Indiana to those in the know but even without that knowledge the small town sensibility was well drawn to a reader who can only vaguely place the state on a map. I’m down to a handful of cosy series these days but I will be adding the next book to feature Robbie Jordan and friends to my reading list. FLIPPED FOR MURDER offers just the right mix of fun, old-fashioned whodunit and engaging characters. This is the 19th book I’m including in my quest to complete the Reading USA Fiction Challenge in which I’m aiming to read a total of 51 books, one set in each of the USA (and one for the District of Columbia). My personal twist is that all the books are by new (to me) authors. This entry was posted in book review, Maddie Day, USA. Bookmark the permalink. Re: your personal US challenge, do you know K. J. Erickson, Minnesota. She only wrote 4, I think, but they are all excellent. I’m glad you enjoyed this one, Bernadette. It really is hard to find a cosy that doesn’t rely, as you say, on gimmickry or on ghosts, etc.. For me, a lot of it is about the characters, so it’s good to hear that these characters are interesting. 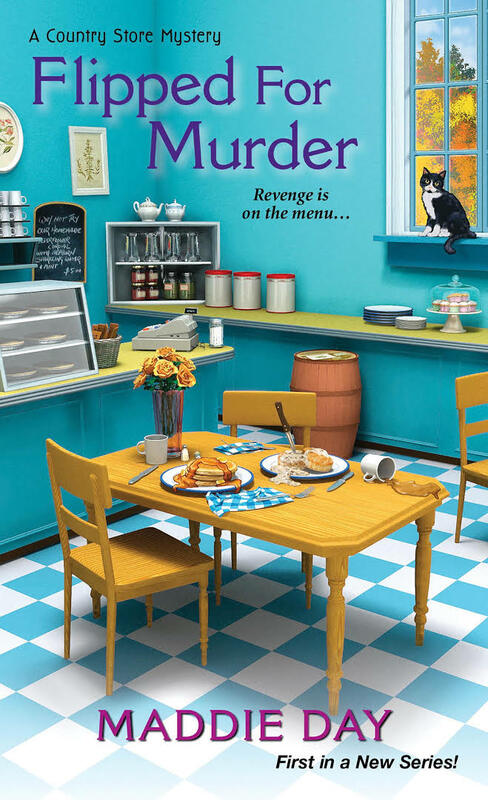 Every time I read one of your reviews of a cozy mystery, I am motivated to try some that I have but I haven’t yet. I do have State of the Onion by Hyzy and there are two or three others I have. I did read one last Christmas that was too cozy for me, although not too gimmicky. Yes, one does need breaks from heavy-duty mysteries or other books. Murder in fiction and life’s current situations require a lot of distractions and diversions. I’m reading a handful of books, and open one depending on my mood. I will try to read this as it’s set in Indiana and I’m kind of vaguely trying to read books from all of the states, although not as a plan. If it’s not too cozy for me, I’ll try it, and if the library has it. I’m getting a lot of good book ideas from this blog, Margot Kinberg’s and Kittling Books.